I knit this hat for my sister from this yarn. 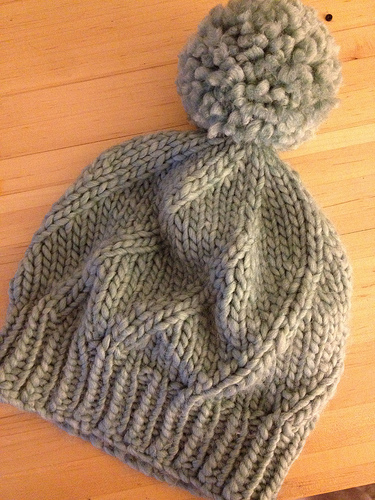 I knit another one with thick & quick for myself. It’s a really a cute & fast pattern. I might have made the pom too big though. I’m a sucker for a giant pom. can one make a pompom too big? I have made this pattern numerous times. Pom Pom tip: tie the pom pom off with log tails and then only tie it on the the hat, this way when you need to wash the hat you can untie the pom pom. Save its shape and the hat keeps its shape better.